The Last Jedi is one of the most divisive movies in recent memory, and if you check Youtube, you'll see tons of channels devoted to hating director Rian Johnson's sequel. They appear to be mostly non-political Americans who once enjoyed the franchise, but are now disenfranchised. Though their voice is loud, apparently they are of a minority, and the majority of The Last Jedi hate we've seen spewed across the Internet over the past 10 months is politically motivated. A new study shows that 50% of the vitriol aimed at the penultimate chapter in the Skywalker saga came from political trolls, most of whom were apparently Russian. In a recent Twitter post, Rian Johnson, who is not above bullying Star Wars Youtubers like the infamous Mike Zeroh, agrees with this assessment that a lot of the hate aimed at The Last Jedi was pushed by a political agenda. The paper comes from academic researcher Morten Bay. It is called 'Weaponizing the Haters: The Last Jedi and the strategic politicization of pop culture through social media manipulation'. That is quite a mouthful. This academic study examines the 2017 debut of The Last Jedi, which is perhaps the most controversial film to ever be released as part of the franchise. Many fans have asked that it be scrubbed from canon. Some are hoping that J.J. Abrams pulls off one hell of a retcon with Star Wars 9. But in his research, Bay believes that the movie's abhorrent reputation has not been rightfully earned. He goes onto state that there is "evidence of deliberate, organized political influence measures disguised as fan arguments." The researcher goes onto say this. "The likely objective of these measures is increasing media coverage of the fandom conflict, thereby adding to and further propagating a narrative of widespread discord and dysfunction in American society. Persuading voters of this narrative remains a strategic goal for the U.S. alt-right movement, as well as the Russian Federation." Perhaps Jeremy Griggs at Geeks and Gamers and Etinpi Skyvor at Comic Artist Pro Secrets will disagree with these findings, but Rian Johnson thinks it's right on the money. He says this about the study conducted by Morten Bay. "A bit of Morten's research came out awhile ago and made some headlines - here's his full paper. Looking forward to reading it, but what the top-line describes is consistent with my experience online. And just to be totally clear: this is not about fans liking or not liking the movie - I've had tons of great talks with great fans online and off who liked and disliked stuff, that's what fandom is all about. This is specifically about a virulent strain of online harassment." 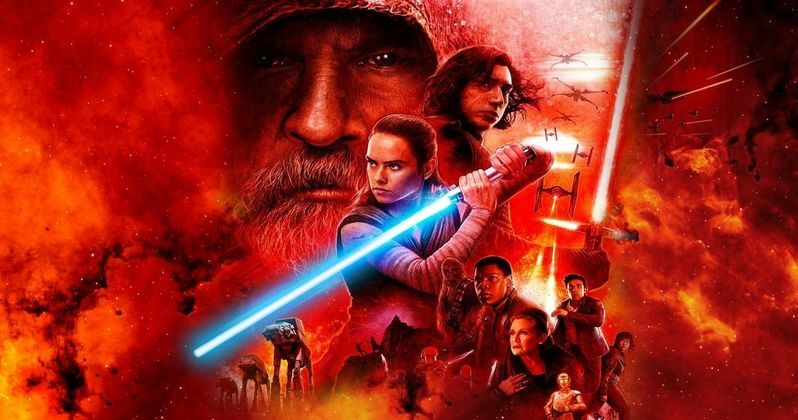 The study takes a look at all The Last Jedi hate from three different directions in analyzing what is really going on. Bay separates the camps into those with a political agenda, the out right trolls behind the overthrow, and what Bay has dubbed the 'real fantagonists". These are fans who are genuinely disappointed with what Rian Johnson did with Luke Skywalker and the overall narrative push behind The Last Jedi. These are the fans who are so distraught, they've considered abandoning the franchise altogether, calling for protests, and burying their woes in all-you-can-eat pie contests. The findings Morten archives in his study are being called 'fascinating'. He goes onto say this. "Overall, 50.9% of those tweeting negatively [about the movie] was likely politically motivated or not even human. A number of these users appear to be Russian trolls." On top of all this, while the screams of hate against The Last Jedi have been quite loud on the Internet, only 21.9% of tweets about the movie were negative. Bay goes onto say this about the venom laced throughout The Last Jedi's bones in this ongoing debate, blaming the fans for not liking the movie because of a perceived politicization by Disney and Lucasfilm. He doesn't believe that the studios are doing anything wrong with the series in terms of what they've turned it into. "[S]ince the political and ethical positions presented in the new films are consistent with older films, it is more likely that the polarization of the Trump era has politicized the fans. The divisive political discourse of the study period and the months leading up to it, has likely primed these fans with a particular type of political messaging that is in direct conflict with the values presented in The Last Jedi." You can see director Rian Johnson's support of the study in the tweets below. You can ready the full study at Research Gate.